I know lots of people are anti-tights but I love them. I have fleecy ones that make me feel like my legs are being hugged by teddy bears all day, purple ones for when I feel sassy and even these crazy ones that look like crochet. Tights help me feel rad in skirts and frocks that are just that bit too short for me to wear comfortably by themselves. So for my latest winter make I gave into the power of tights and finally sewed myself up the quintessential indie mini of the decade- the Moss Skirt. Huzzah! This boss pattern is the Grainline Studio Moss Skirt. It is a semi-fitted skirt that sits slightly below the natural waist and features a fly front and button closure as well as a yoke at the back. View A rocks the whole mini vibe while View B has a hem band to add length. As I am a part-lizard person, the cold is my enemy and longer length is the way to go- though I went the Version A and added 3” as the hem band was not my bag. The fabric is a gorgeous Japanese cotton duck that I picked up from Mill Rose where we all stayed for Sewaway back in June. After binging on delicious fabric at Tessuti the day before, I was super cash poor so scraped up enough funds to grab 1m leaving me short on what the pattern recommends. I mean, would you rather have possibly enough rad camera fabric to make your skirt or no camera fabric at all? I think we all know the answer to that… Luckily, this lady is as pigheaded as she is frugal and I managed to squeeze the Moss out of the metre AND matched the cameras pretty dang well. Let’s call this level of achievement Sewing Wizard, shall we? The pockets. These ones are designed with ease to get your hand in and out. Talk about a godsend for the lady with gorilla paws instead of hands. Now I can carry a bunch of bananas AND get my hands easily into pockets. Winning at life! Camera fabric! I can’t recall the last time I made something using a crazy printed fabric. Oh, novelty prints! How I have missed you! Size up. I wants me some more room for ice cream! Add another inch in length. This is just a bit too short for me to wear comfortably without tights and I’d love to have a rad summer version. Maybe one with flamingoes on it- summery AND sophisticated… This needs to happen! Insert the zipper and fly correctly. Is it a weird sewing nerd thing to say I want to make some samples? Nahhhh, all the rad ladies practice! I love this! Novelty fabric without looking like a novelty! Also on etsy have you seen the ombre tights? I am not linked with any sellers but I keep looking at them and trying to think what outfit I could put with them to justify buying them!! I just checked out ombre tights on etsy- holy monkey hats! I am so getting some!!!! And I love winter for the tights too. Awesome! Loved the write up too. You always make me laugh. What’s next in the sewing line-up? Who you bossing around? *hat tip* Why thank ye! Thanks for a fab review. Definitely going to give this pattern a go. I’m tights all the way in the winter. Crikey that thing would be a belt if it was 3 inches shorter! I love it on you, for what it’s worth I think the fit is great. Maybe next version same size but use a fabric with a little stretch? I too am yet to make this -one day it shall be so! I bow to your sewing wizardness! Seriously, is it possible to own more than one Moss and not have a novelty print one? It’s just made for them! I look forward to some pink flamingo summery awesomeness! Side note: totally committed to a pink flamingo one to wear with a white singlet, flip flops and a floppy hat. This. Must. Happen. Not going to lie- your rad deer print one was my total inspiration! For real, the pattern is 3″ shorter? Who over the age of 16 would be wearing that? This is super adorable and the camera fabric is the bomb! It looks great on you. Perfect flattering shape and so cute without being cutesy. Win!! Thank ye- the camera fabric was such the perfect find! Pattern matching perfection and a cute skirt. Love the idea of a flamingo one for summer. You are just the cutest! That print is perfect amount of fun. You totally crack me up lady… Bananas..! Great looking skirt and love the fabric..
You better believe I’m doing a SYD fabric run soon to try and score flamingo fabric! love, love, love. I have a moss front and back sitting about in a UFO pile – zip was done with a little bit of headscratching, but I used a metal one and it’s taken some muscles (but you still have to be careful) to remove the extra teeth. I cut that out of 1m remnant (at EASTER TIME)…..sigh. Ohh, just sides to stitch up and a waistband to attach? You can do eeeeeet! You are so adorable! Love the skirt. Love the fabric. And of course love the camera taking while wearing a camera skirt photo. Killing it as always!!! 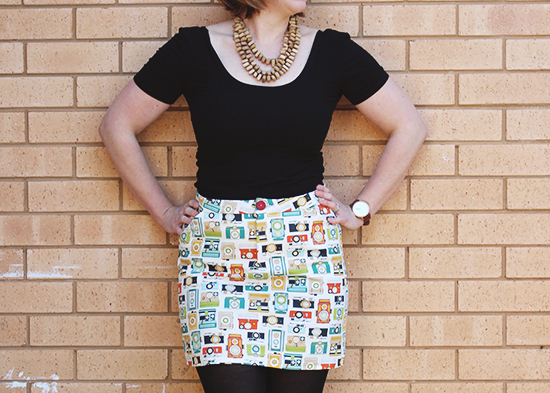 This skirt looks awesome, and I had several good laughs reading this post – Sewing Wizard! And I haven’t made this yet – mini’s aren’t my bag, baby – but I wonder if the zipper insertion post from Closet Case/Heather Lou’s Ginger Jeans pattern would be helpful. I’ve found that to be super clear for jeans making. Obviously that skirt is rad, but inquiring minds need to know: where did you get those boots?? I’m a little worried about the cobbler’s diagnosis on my current pair. And I love yours. Perfect! Cameras! Fleecy tights! Cocoa! Knitting! All the good winter things. Love the skirt. How short must it be normally??? For once, I am glad to live in Ireland, so I can wear tights almost any time. Like, this summer, I went tightness only 5-6 times. The skirt is a killer! You need to make it in other crazy prints: koalas, cupcakes and raptors! Love that you used the button from La Collectione too! Oh my! I love this ridiculously much!! I had the same trouble with my zip on the Maritime shorts. I’m not dismayed! Next time I’ll go with a method that makes sense to me.